We can in a sense be grateful to the Superior General of the Society of Jesus for bringing our attention to the true source and origin of the current crisis in the Church. The crisis concerns, of course, the Person of Jesus Christ and how He is thus viewed or 'interpreted', what Faith in Him means, or whether it really means anything at all. Naturally, the only disagreement I would have with the Superior General would be that I would call this desire to 're-interpret Jesus' an expression of this crisis, where he would see no crisis, but only 'renewal'. Making our image of Christ depend entirely on the whim of whoever is sitting on the Chair of Peter, or those who surround the Chair, or simply an image from our own imagination, or of those who have the Pope's ear is, in my opinion, completely unnecessary and utterly mad. One need not exercise one's grey matter too much to 'discern' that when a Jesuit says it is time to 're-interpret' Jesus, His words and His teachings, it is most likely time to discard his true teachings and replace them with his own novel ideas. These ideas will, most likely, lead to a dramatic decrease in emphasis on Our Lord's divinity and a sudden spike in emphasis on His humanity to the detriment of His divinity. I'm sure there's a good graph one could do for this to illustrate what happens as it does, in an exponential manner in our ratio. Or something such like. We can be more or less certain that the 're-interpretation' of Christ and His Teachings follow a similar path from clear and forthright teachings rubber-stamped 'absolute truth for your Eternal Salvation' to a mixture of wise sayings and heavily edited epithets that make the Gospel incredibly easy for modern man, that refuse to confront man about his reality and the reality of God's existence and that render Jesus Christ meaningless and irrelevant to all who may hear His Holy Name or read His Words. Indeed, as the Holy See is transformed from the fearless proclaimer of Catholic Truth to a subservient 'Ministry of Truth' for the worldly powers foreseen in 1984, we can expect precisely this method of sending the True Christ out to the peripheries and a false Christ being invited in, if, indeed, he hasn't already entered. Do I have this right? Christ's teachings on marriage and sexuality would eventually be rendered completely acceptable to contemporary man, Hell's existence, even Heaven's existence will be reduced to philosophical ideas. I think we know the score. Christ's words on even the Eucharist, the very words of institution which provide His children with His Most Sacred Body and Most Precious Blood can be 're-interpreted', His Blood no longer poured out for the forgiveness of sins but a 'healing remedy' for the unification and brotherhood of Christian churches and religions? However, for those who are concerned about all of this, take a grain of consolation from the fact that if Jesus Christ, the Lord Almighty can be subject to such blasphemous 're-interpretation' then mere men, Jesuits such as Fr Arturo Sosa S.J, His Holiness Pope Francis (not Persons of the Most Holy Trinity) are fair game. I look forward to those years in the future, should God grant us them, when Pope Francis and the Superior General of the Jesuits (though such figures as Jesuit Superior Generals can be so easily ignored) have their words and authoritative statements) subject to such a 're-interpretation' that they no longer mean what they intended them to mean. One can imagine future clergy, bishops and laity sitting around talking about those words of Pope Francis, or a future Pope entrusted with his 're-interpretation' for contemporary man. If Christ the Second Person of the Trinity can be 're-interpreted' for modern man, then so can Pope Francis, right? If 're-interpreting Christ Who is the Lord' can be achieved so easily, then 're-interpreting Pope Francis' for Catholics should be a pushover. After all, if we can do this for Christ, whose words are 'recorded' from when He spoke in the past, the words of Pope Francis which are 'recorded' from when he spoke in the past can be made to mean the complete opposite of what the words recorded actually say. Perhaps one day a Pope will have to do that. That'll be messy, but it will also be necessary. Let's not hear any protestations from the Jesuits when/if that happens. After all, if God's Word can be subject to such a radical interpretation, then so can those of this Pope who will one day belong to the past. Besides, it isn't as if Pope Francis is / can be more authoritative than Almighty God, is it? That would simply be illogical. 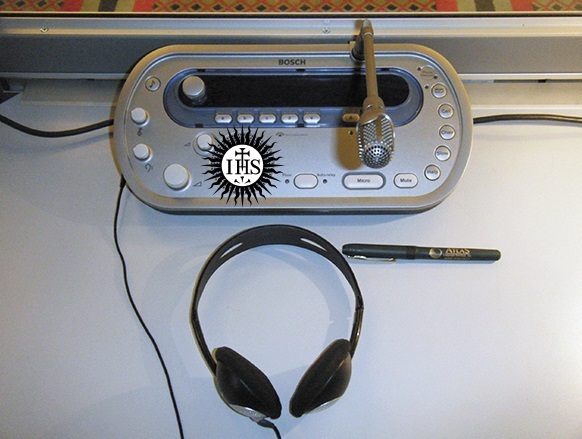 We'll need to borrow that Jesuit 'interpretation' device and turn it into something a little/lot more orthodox, maybe get some Dominicans or some of the FFI to re-wire it but nevertheless, let's not hear any complaints when the words of Pope Francis are made to sound completely, resolutely Catholic and utterly in conformity with both the words of Our Blessed Saviour and the Sacred Tradition of the One, Holy, Catholic and Apostolic Church. I can just hear the screams of horror! You can't re-interpret Pope Francis in continuity with His predecessors to render his words and strange doctrines irrelevant??! Is nothing sacred!?? How dare you break the First Commandment of Bergoglio-Church! Infidels! Heretics! How long, O Lord, how long?! Abascal: So then, there would have to be a lot of reflection on what Jesus really said. At that time, no one had a recorder to take down his words. What is known is that the words of Jesus must be contextualized, they are expressed in a language, in a specific setting, they are addressed to someone in particular. Abascal: Over the last century in the Church there has been a great blossoming of studies that seek to understand exactly what Jesus meant to say… That is not relativism, but attests that the word is relative, the Gospel is written by human beings, it is accepted by the Church which is made up of human persons… So it is true that no one can change the word of Jesus, but one must know what it was! So, given that the reflection of the Church over the previous two thousand years on what the words of Jesus mean, has no significance for the here and now, just how long does any modern ‘discernment’ last for? A year? A month? A week? A day? An hour? A minute? A nano-second? Or is the current head of the Jesuits a kind of Maoist, calling for “Permanent Discernment”? Meaning, “Permanent Re-Discernment!”. And is any 'discernment' more authoritative than another or can we all get in on the act and produce our own, equally valid, discernments? The members of ARCIC won't like this. After all, what's the point of discussing doctrinal agreement when 'discernment' will make any so-called agreement redundant before the ink gets dry. There WAS a time when a 'tache like indicated the wearer was NOT in orders. Is sr el General trying to tell us something? 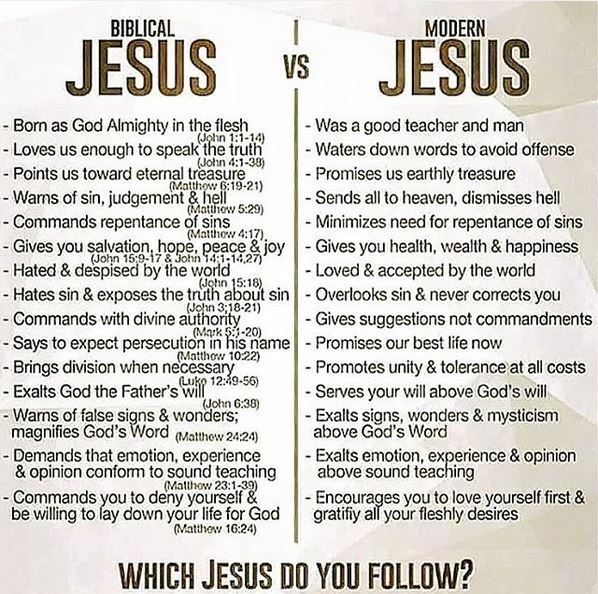 By the way, that biblical Jesus vs the modern Jesus is important at this time. It will be the crux on which the Youth Synod will try to destroy the faith and destroy the family. The Youth Synod WILL BE the next attack on the family, and on the true faith. All Catholic youth work in this country now has its roots in Catholic Charismatic Renewal. CCR has infiltrated ALL Catholic youth work and is brainwashing our young Catholic people into believing in a protestantised false religion (i.e. all contained within the graphic). CCR youth leaders have even been caught attending Mass in the morning and then attending pentecostal services later on (it is documented online, even by a Premier Radio presenter/blogger). The CCR youth leaders can also be found running off to HTB (Anglican) leadership conferences (they don't even bother hiding the fact these days - just read the Trasformed in Christ site blog - they are even elevating the work of Rick Warren at St. Elizabeth's these days). The best example of youth work we had (Youth 2000 - which was formerly helped by Fr. Hugh Thwaites and Fr. John Edwards) is now even being muddied by the CCR false anti-Catholic mindset, after years of solid and faithful work. In the 1970's Cardinal Garcia called the CCR "The Smoke of Satan that has infiltrated into the Church". They were also accused in the 1970's by Prof. Massynberde Ford of manipulating Cardinal Suens into getting a foot hold within the Vatican (though Cardinal Suenens had his own issues - see link below - he was the Cardinal who introduced communion in the hand and ecumenism). Cardinal Lopez also accused the CCR of "eliteism, fundamentalism, protestant corruption, chaismania, paraclericalism, and authoritarianism". Now the CBCEW have asked our young Catholics to answer the pre-synod survey. They will only receive answers inline with the CCR agenda that has brainwashed and taken our Catholic young people away from the One True Faith. FACT!